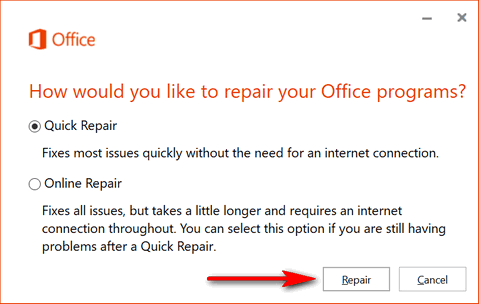 If you have Microsoft Office installed and one or more of your Office programs are not working correctly, you can sometimes easily fix MS Office by using its built-in Repair feature. Here’s how to use it. Open Control Panel > Programs and Features > Uninstall a Program. If you’re using Windows 10 version 1703 (Creators Update) or 1709 (Fall Creators Update), Control Panel isn’t easy to find. The fastest way to open Control Panel in those versions of Windows 10 is by usingWindows Key + R to open a Run box. Then type Control in the run box and press Enter…Control Panel will open. When you click on Change, you’ll see your repair options. Note: Yours may look very different than mine since you’re using an older version of Office. This should fix any minor problems with your MS Office programs. If Quick Repair doesn’t work, try the Online Repair. It can take a long time to complete. Only run the Online Repair if Quick Repair doesn’t fix your problems. Always run Quick Repair first. If you decided to do an online repair, make sure that you have your product code available since they will reload office and request request a product code or tell you that your trial period has expired. If your get trial period expired you will have to get a MS help person t guide you to the area that you can enter the product code. I wish that I used Faststone Capture when I just went through it for the second time so that I could show how. Thanks Ron. A quick way to find your Microsoft Office key is to use a product (key finder) called reCALL. You can read more about it here.